A VISIT TO THE CEMETERY « THE BRYCE IS RIGHT! I visited the local cemetery on Fathers Day last month to pay my respects to my father who is interned there. I pass by the cemetery often, but I’ve made Fathers Day a day for a ritualistic visit. We interned his ashes at the cemetery so the family could have a place to visit and remember him. 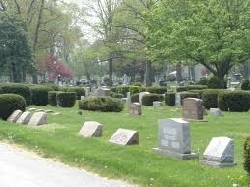 It’s a nice cemetery, very clean with places to intern people like my father, as well as normal grave sites with a variety of headstones. The grounds are well manicured and have some fine shade trees. It’s actually quite picturesque. The cemetery is nondenominational which, I assume, includes people from all walks of life. My father happens to be interned next to a Jew, a Polish Catholic, and some other name I had trouble pronouncing, I suspect it’s Slavic in origin. There are also a lot of Italians nearby with some Germans as well. It’s quite a racial and religious potpourri. Realizing I was in the midst of such diversity, I wondered how all these people would get along if they were still alive. No doubt arguments would quickly erupt as to who was sitting next to who. I could imagine the sniping and name calling from the various groups represented there. I wonder if the Catholics and Baptists know they are buried next to the Masonic section? I’m sure they would accuse them of being devil worshipers. I thought I heard the veterans grumbling about the draft dodgers buried nearby. No doubt the members of the Klan would have a few choice words for the blacks buried there, and vice versa. I found it interesting to see some members of the clergy buried near some crime bosses, it kind of makes you wonder if they are there as a sort of permanent confessional. As I looked around, all I could hear was a lot of name calling and finger pointing. Frankly, I was getting a headache from all the ill-tempered discourse. Wanting to clear my head, I took a walk underneath a row of shade trees. Only then did I realize how peaceful and serene the cemetery was. Whatever arguments they may have had in life, they were all settled at the cemetery. Perhaps that is what we’re intended to do during life; to disagree, fight, and find new imaginative ways not to get along. There is plenty of fodder to argue about too, be it related to religion, race, social status, politics, property, economics, ethics and beliefs, or whatever we’re in the mood for. Yet, it seems a shame the only way we can settle our differences is by a trip to the cemetery, where all disagreements are settled once and for all. Before turning to leave, I surveyed the grounds one last time and imagined the helter skelter that must play out each night around midnight as the ghosts rise up and begin to squabble over petty nonsense. No wonder the cemetery is closed at dusk. I don’t think anyone could stand the racket.